Annie Bellamy loves horses. She grew up showing horses and the buying, selling, and showing of horses led to the bankruptcy and break-up of her family, and perhaps, her mother’s death. She now is trying to come to grips with her past as her own daughter, Teddy, falls in love with horses the same way she did. She vows that history will not repeat itself. Teddy’s talent cannot be denied. She connects with these horses like Annie never did. Her daughter’s passion does come with a hefty price tag and she wonders how that will impact her family. She also never imagined the ruthless barn owners, the crooked trainers or the viciously competitive show moms they would meet on this journey in the horse world or “saddle soap opera”. Annie realizes that making her daughter’s dreams come true is going to take courage to stand up to all those around them wanting them to fail. A captivating and inspiring story of a mother’s love and the special bonds of mother and daughter. Based on a true story, Lesley takes us into world of showing horses. What happens behind those barn doors and in the practice rings. The greed, the jealousy, the corruption, she tells all. 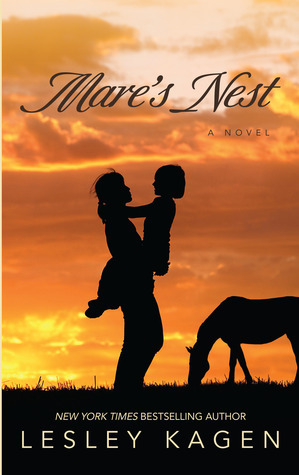 Mare’s Nest is a term defined as “an extraordinarily complicated situation”. That’s what the horse world is, a series of extraordinarily complicated situations. I love the way Kagen writes with heart and humor and the strength she gives her characters. Annie and Teddy had quite an uphill battle and a few missteps but it made each of them stronger and their relationship stronger as well. As a mother with two daughters myself this book touched my heart. It also made me thankful they played volleyball, basketball and softball. The competitive parents are still there, the coaches did have their favorites, but the equipment can be put in a closet or the garage in the off season. A horse needs care year round and my heart would break every time one got hurt or would have to be sold. You do not need any knowledge of horses or the competitions involved in showing a horse to love this book. I sure didn’t and I absolutely loved this story. It is a powerful story that every mother or daughter would enjoy. It is a truly awesome book! Definitely worth 10 stars!!! The horse “business” can be heart-rending. That is an animal that I will not let myself get attached to!